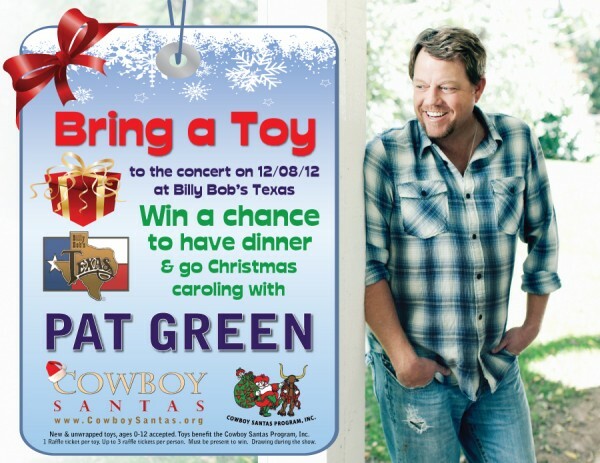 This Saturday (12/8) you can bring an unwrapped toy to Pat's Billy Bob's show and be entered for a chance to win dinner and caroling with Pat! All toys will go to Cowboy Santas. You get one raffle ticket per toy, and up to 3 raffle tickets per person. Toys are for ages 0-12. You must be present to win and the drawing will be done at the show that night! Hope to see you there!